E-mail written 2003 to Lew Griffin from David Kennedy, e-mail address,. Biography* � A grandson, John William Culpepper, wrote 21 May 1993: John Micajah Culpepper was born 20 August 1859 in Rusk County, Texas. He lived in Rusk County, near Marshall, Texas for at least 6 years after his father was killed. His mother, Emily Elizabeth Culpepper, married Frank R. Kincannon in Mc Lennan County Texas in 1869. He moved with his mother, stepfather and sisters Elizabeth and Willie to Mc Lennan County after 1870. 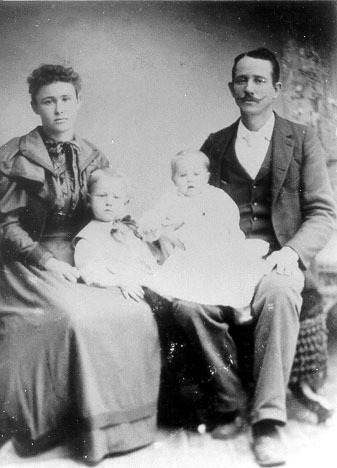 (per Rusk Census) By 1880 (census) he and Elizabeth were living with his aunt, Bell (Belzora Reese) Miller, Mrs. S. W. Miller, in Belton, Bell County, Texas and working as a clerk in S. W. Miller's store. Elizabeth, Lizzie, subsequently married F[irst] N[ame] U[nknown] Orr and moved from the area. Willie died sometime after 1870. + William Jefferson Culpepper, 25 Oct 1837 - 8 Apr 1864, Co. F, 17th TX Cav. (Marker, only. Buried at battlefield in LA). Fanny Carpenter, F, 28, Black, Servant, S, KY KY KY.